Last year’s iPad Mini 2 got the Retina display, a significant boost in readability. This year’s iPad Mini 3 has hardly changed at all. The first iPad Air, introduced in October, 2013, was dramatically thinner and lighter than its predecessors (the original full-sized iPad 2, 3, and 4). This year’s iPad Air 2 is a little more svelte but you need a micrometer to tell. I watched Apple's announcement event, where CEO Tim Cook breathlessly mentioned that it was "18% thinner" than the previous model. No gasps were heard in the crowd. More musical to the ear was Apple's upgrade to a 64-bit A8X processor in the Air 2, which is touted to be 40% faster than the previous model. The Touch ID fingerprint scanner is the biggest addition to the iPad Air 2. Fingerprint scanners have been around for decades. Apple promises to make marvelous, revolutionary apps available thanks to the Touch ID, including Apple Pay “contactless” payments (which doesn’t work with iPads but only with iPhone 6 or 6 Plus). But consumers haven’t taken to biometrics in general, and Apple Pay doesn’t seem likely to inspire them. The iPad Air 2 has a better camera, if you take photos and videos with a 10-inch tablet. Oh, and it comes in gold color now, too, if that’s all that was stopping you from dropping $499 on a base model. What the iPad Air 2 is missing, much to enthusiasts’ angst, is a larger display area; higher screen resolution; a snap-on keyboard; a lower base price; and longer battery life. In fact, the Air 2’s battery lasted 90 minutes less than the original Air tablet in the same test. Ten-and-a-half hours is still pretty good, but an Android-powered Samsung Tab S 10.5 tablet lasts 11 hours, 15 minutes in the same test. The Air 2’s pricing is the same as the original Air: $499 with 16GB and WiFi only, ranging up to $829 for 128GB with cellular as well as WiFi connectivity. The iPad Mini 3 starts at $399 and goes up to $729. Both new iPads offer faster Wifi and a new kind of cellular SIM card that makes it easier to switch carriers. But cellular iPads are in the minority and users don’t switch carriers that often. The depression of earlier iPad models’ prices seems to be the best reason to welcome the new ones. Last year’s iPad Air is suddenly $100 cheaper, at a base price of $399. The original iPad Mini, from 2012, now goes for $249 new (and it's still for sale on the Apple website). Overall, it seems Apple is selling smaller improvements to an ever-smaller audience. The vast majority of iPad owners are still using original (Air-less) iPad 2, 3 or 4 models, and Apple tablet sales have been on a downward trend for the past year. You might read this and think I'm an iPad hater. No, I'm just disappointed (along with many others) that the latest crop of them seems to offer little in the way of innovation -- nothing to make you say "wow." Across the board, iPads are good-looking, well made and they integrate nicely into the Apple product line. If you have a Mac or an iPhone and are looking for a tablet, I'd tell you to buy an iPad. If all your friends or family members are Apple fans, that's another reason to go iPad. If you're a Windows user with lots of music in your iTunes library, the iPad wins again. But they are also expensive, compared to similar sized offerings from the competition. Amazon's HD Fire 7 tablet costs just $139, which is $260 less than the iPad Mini 3. The Nexus 9's $399 price tag is $100 lighter than the Air 2. Those models, along with offerings from Samsung, Asus, and Acer, are slick and well made. And there are scores of off-brand Android tablets on the market at even lower price points. Will This App Replace Gmail? 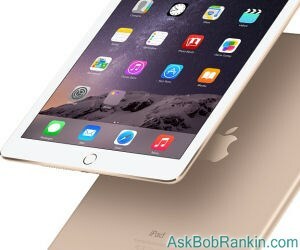 Most recent comments on "New iPads: Worth a Look?" I am waiting for a worthy Ipad that lets me call and text. People don't want to carry a suitcase full of gadgets to do the job. That is why I am not purchasing a new Ipad as yet until they meet my needs adequately. Bob, just a thought ... Could the iPad product, be less impressive, due to all the tablets on the market, that are much, much cheaper??? Just a thought. I really don't care to invest money into any iPhone or iPad product or anything Apple, really. I am very happy with my Windows 7 Professional OS and love my Android SmartPhone ... Why would I want to spend more money, than it is necessary? I don't care, that others want to have an Apple computer or an iPhone or an iPad, that is perfectly fine, with me. Anyone else, can spend their money, anyway they want to ... Just don't try to "brow-beat" me, informing me, that Apple is the best and only way. Apple "devotees" will buy just because it is Apple. (And there is no doubt that the kit is good!) Wouldn't you just love to have such dedicated customers. But... clearly, that does not grow your market share. I owe YOU a Big Thank You for this rundown as I was considering going over to the Apple (world) with the purchase of the latest iPad (I already have their iPod Shuffle) as I have been a Staunch Windows person forever! Nevertheless, I'll await one of your narratives to see what you write about the next Apple product . . . I'll wait to see What the NEXT WOW from Apple is going to be! apple had better preschool Apps. It made coming to Grandma's house much more attractive. With its Clamcase keyboard I now take it on trips instead of my Windows 8.1 laptop. And, Dorothy, if you know the recipient's carrier, you can text from email. Goggle it. I have no need for this new iPad. I wish iPad's OS would allow two windows side by side! Bob, thanks for another objective review. There probably isn't a big driver for most owners of any recent iPad to upgrade, but don't forget there are incremental improvements in a number areas over the original iPad Air which was still being sold just over a week ago for the same price. So I think I'd opt for the new model if I wanted a new Apple full size tablet. Bob Thank you for yet again a great article , the technology goes on and on for making money which has to be to stay in business ,I am sticking to the good old fashioned desktop .which does all that I need and more .together with a very large screen,Long may they reign. Just signed up for your web site and just ordered an Apple Ipad Air 2, 16gb a few minutes ago from Microcenter, because they dropped the price to $399. I am a lawyer, and I am in no rush to open, because I am still debating. I see fewer and fewer tablets at the courthouse. I use a Samsung Note 2 phable and haven't used an Apple product in four years. It is hard to adjust to and I miss the return button. One positive of Apple though is resale. I got on the large cell phone band wagon early, which means Android, but the might switch back to Apple 6 Plus. Wish they had an S pen.